OAKLAND, Calif. (AP) Stephen Curry believes the Warriors are close to being their old, dominant selves again, even if so much seems to be going wrong so far. The defending champions are showing some serious flaws – and coach Steve Kerr is calling out his team to be far more composed. ”When our intensity and energy rises on defense I think we’re a pretty good team,” Johnson said. He pledged $1,000 through ”Points With Purpose” for each point he scored during this three-game homestand. ”I’m still watching that video over again trying to figure out what I did wrong,” Green said. 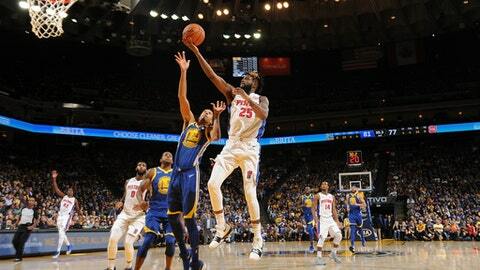 Pistons: Detroit rallied from 14 down – 68-54 midway through the third – to go ahead by 13 then held off a Warriors flurry. … The Pistons shot 12 for 27 from 3-point range and made all 17 of their free throws. … They snapped a seven-game losing streak on Golden State’s home floor. Warriors: Curry hit a career-best 54 straight free throws dating to his final two last season – 52 in a row to begin this season when he missed a technical shot in the third. ”It was a good run,” he said. … The Warriors had gone two straight games with 17 turnovers before finishing with 25 Sunday.